My mother gave me my Uncle Otis’ crank wall phone recently. It’s a wooden box just like the one you see in the movies, that hangs on the wall with a handle you turn, a earpiece, and a mouthpiece. I remember being fascinated with it when I saw it hanging on his wall in Albuquerque in 1958 when we stopped at his home on our way to California. 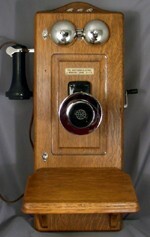 It has been adapted to use as a dial-tone phone. That phone is over 100 years old. I have my grandmother’s black dial desk phone too, with the clear plastic label in the center of the dial with her phone number neatly typed on it. She used it right up until she passed away in 1985. That phone is at least 50 years old. I still have my own blue Slimline phone which I keep in the bedroom. I don’t keep it hooked up, since it has a loud ringer which can’t be turned off. That phone is about 41 years old. We are now a throw-away society. It costs as much to fix something as to buy a new one. Many people are cancelling their landline phone and opting for only a cell phone. Some people get a new cell phone once a year when their contract runs out and throw away the old one. If I were God, I would have been sorely tempted to discard Adam and Eve after they sinned. After all, they were the only human beings alive. God could have easily created a new couple to take the place of Adam and Eve, and start all over with His plan, but He couldn’t do it. He created them himself out of the love in His heart, and, even when they failed, He had a plan to redeem them, because we aren’t disposable. “Long before he laid down earth’s foundations, he had us in mind, had settled on us as the focus of his love, to be made whole and holy by his love.” Ephesians 1:4 The Message Bible.